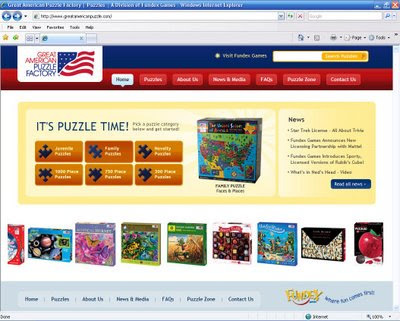 TBH Creative was hired to create a redesigned and more functional web site for a new division of Fundex Games featuring puzzles -- The Great American Puzzle Factory. The web site utilizes a custom developed maintenance application and shows off the various types of puzzles they have to offer from Novelty puzzles to Children puzzles to various piece-size puzzles. TBH also helped integrate an RSS feed reader to import news from their blog. Visit the web site to learn more about the Great American Puzzle Factory and Fundex Games. About The Great American Puzzle Factory Great American Puzzle Factory is a division of Fundex Games and creates cutting-edge puzzle products including Alex Beard’s Impossible Puzzles, Clearly Puzzled™, Make ‘Em Move™, and licensed puzzles. Fundex Games is well-known for many of its other games such as Phase10®, multiple award-winning Alfredo’s Food Fight™, and all-time classic Gnip Gnop™. Fundex is "Where Fun Comes First" and is based near Indianapolis, Indiana. Follow Fundex Games on Twitter and YouTube. TBH Creative welcomes the opportunity to help you with your web site redesign project. Give us a call today for highly effective and reliable web design services.